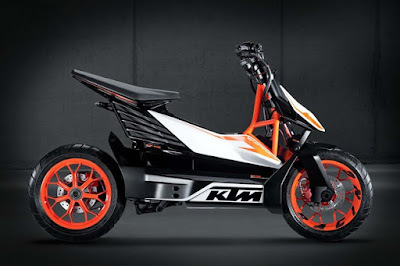 KTM, an Austrian motorcycle manufacturer reported the progress of the development of 'new drivetrain system' to 'urban mobility scenarios', which is considered one of which is an electric motorcycle. Although the report was not mentioned specifically and definitely, on the model and the alternative propulsion. Indications are known, that KTM is developing a propulsion of battery powered or could it be a fuel cell. Even in 2013, KTM ever displaying a motorcycle concept named KTM E-Speed, an electric scooter concept. And the scooter model is suitable for mobility in urban areas. As quoted from Visordown on Friday, April 1, 2016, the latest concept models reportedly designed for the urban areas mobility, but the KTM itself is still developing an appropriate model for the electric motorcycle, which has a larger battery power as well as the motor is more powerful than the previous generation. The development is also done on the lighting system, the headlight of KTM electric motorcycle will be designed more durable and stronger on the extreme conditions. With a maximum light level but not glare and claimed will improve the safety factor for other motorists.